Andy: The J.M. 10 year has a nice smoky aroma with a little bite to it. It has less bite that the other J.M. 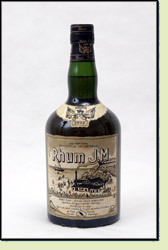 rums which is nice. It’s not bad mixed with Diet Coke, and it would make a good base for some boat drinks. Adrian: It has a lot less bite than the J.M. Rhums with just a touch of bitterness. It’s really good mixed with Diet Coke and I would serve this to my guests as a unique rum. It would also be really good in some tropical libations.